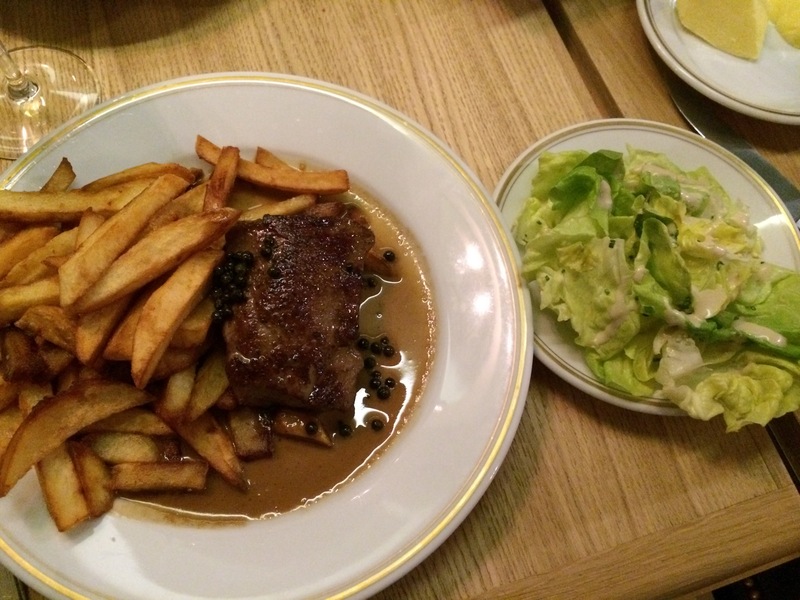 When comparing it to other Paris bistros, this place feels lavish and expensive. 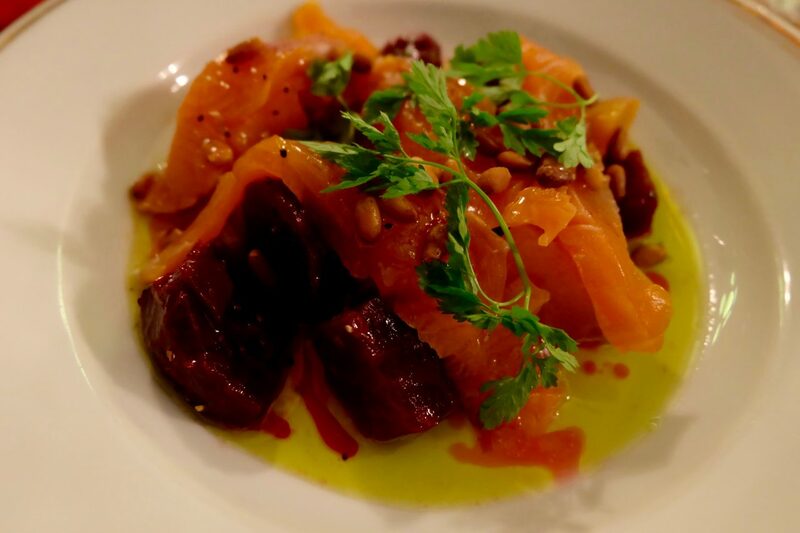 On the surface, La Bourse et la Vie appears to have much in common with a neighborhood bistro serving classic dishes like poireaux vinaigrette, steak-frites and pot au feu. 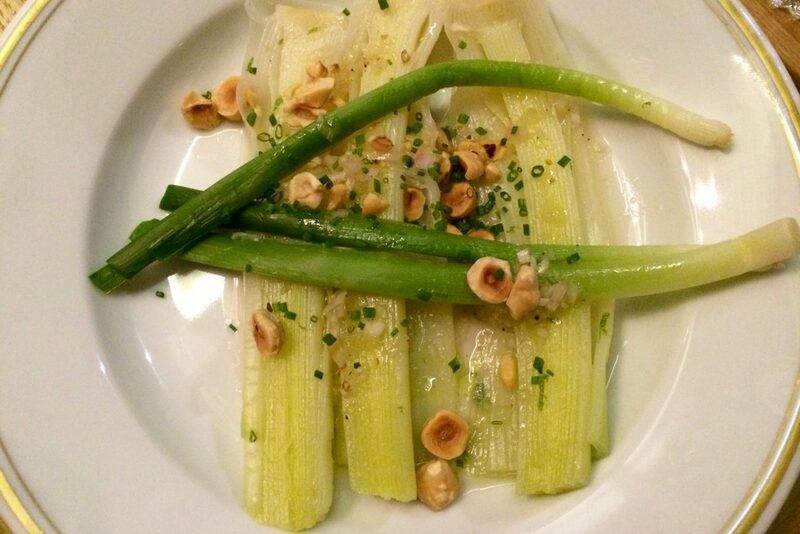 But look more closely and you’ll learn that the leeks are dotted with hazelnuts from Piemonte and the steak is 30-day aged Simmental beef. Rose, who is obsessed with old recipes, continues to resurrect and refine vintage dishes that modern-day travelers are rarely able to encounter. 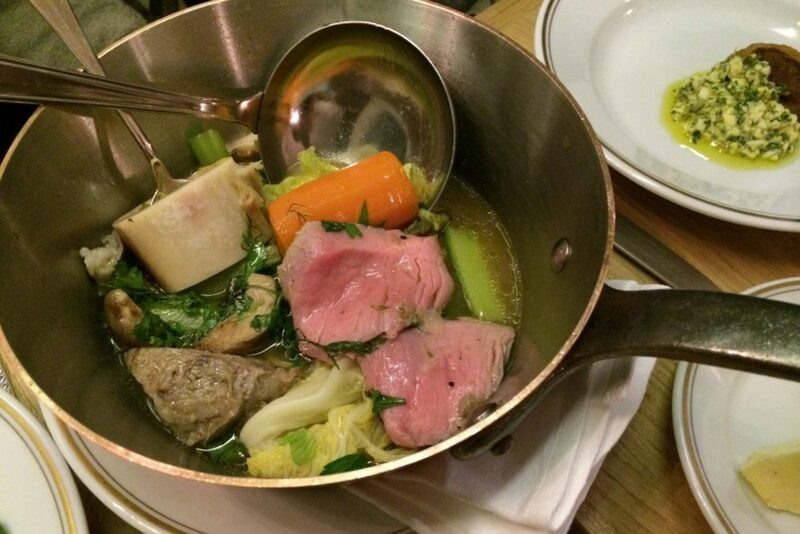 His version of pot au feu is deeply delicious and evokes the classic dish that was bubbling a century ago on stoves all over the nearby market neighborhood of Les Halles. However, it’s radically different and probably more delicious than the original because it marries perfectly cooked (not boiled to death) cuts of veal and lightly cooked vegetables with the sort of profound bouillon (broth) that has become Rose’s signature. It’s also served with a side dish of tête de veau with a sauce ravigotée. More “authentic” Paris bistros are not making food like this anymore. All of this specialness doesn’t come cheap, of course. 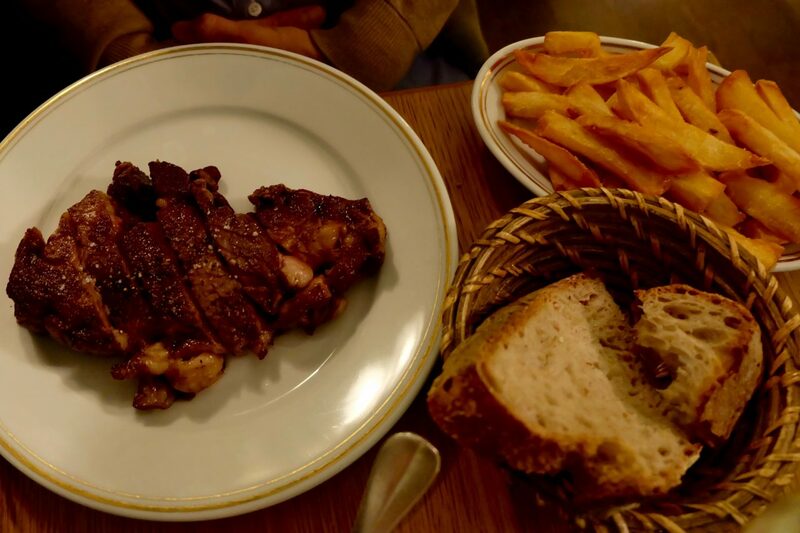 That delicious steak-frites is priced at 39€, and dinner for two is likely to be 120€ before wine. 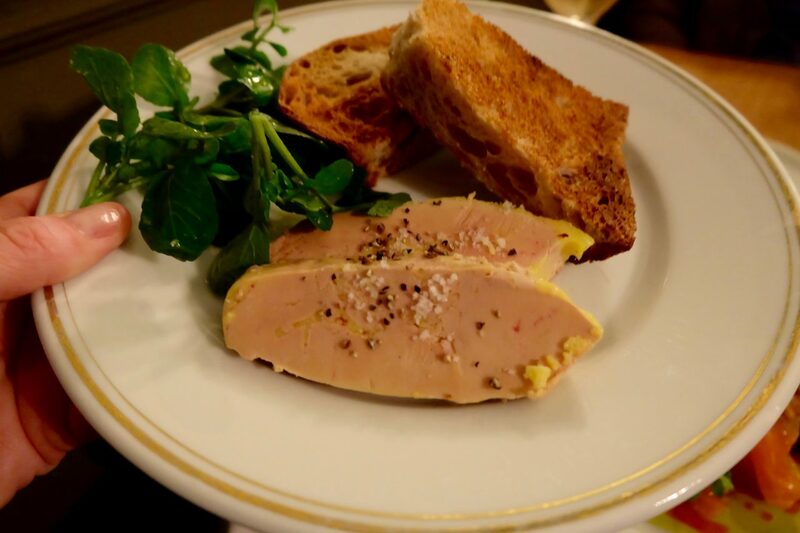 However, most new restaurants that have opened in the years since Rose took over La Bourse et la Vie are offering much less for a similar price. Paris is becoming very expensive. 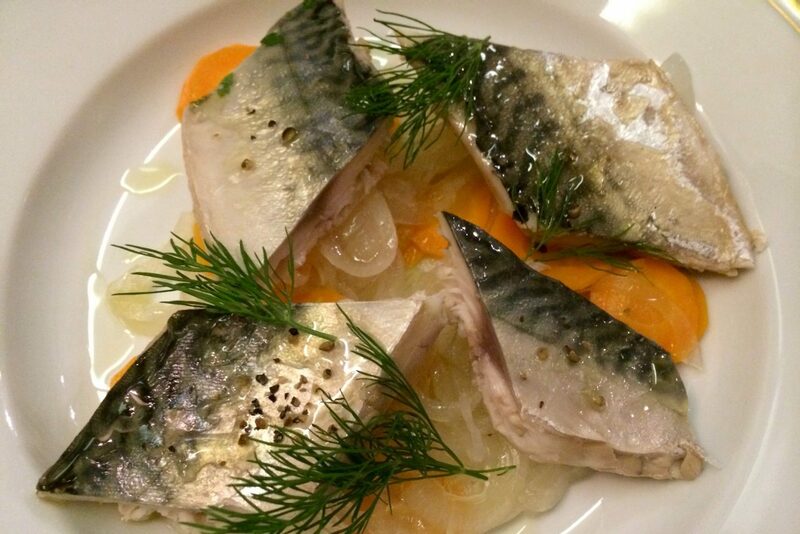 At La Bourse et la Vie, it’s both expensive and very good. Hours: Open Monday-Friday for lunch and dinner. Closed Saturday & Sunday. Simon Says (2015) François Simon says there is nothing bad to report here, calling it a superb demonstration and praising the foie gras with artichokes, the leeks in vinaigrette, and the quail fried in buckwheat batter. He finishes by attributing “the radiant air of a blossoming chef” to Daniel Rose, who is now cooking in New York. 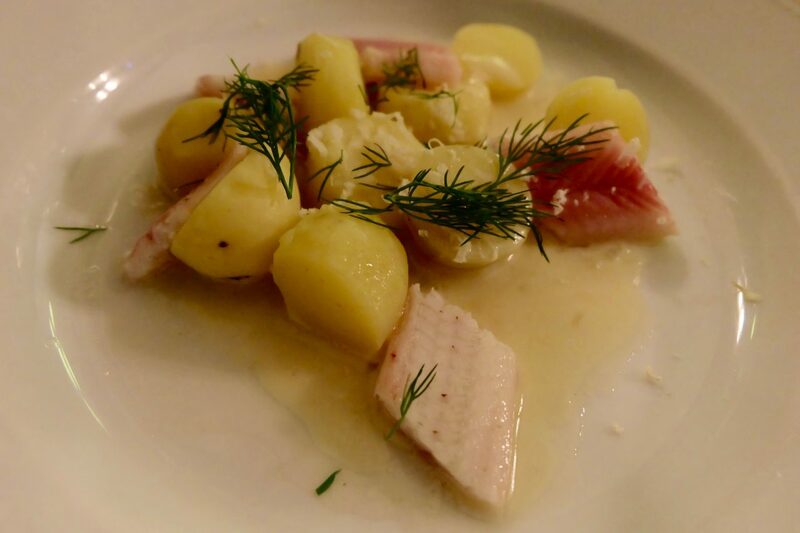 Table à Découvert (2015) Caroline Mignot is in heaven tasting the leeks in vinaigrette, calls the fried quail an “absolute pleasure,” and announces that crème au caramel figures in the pantheon of greatest crèmes au caramel ever made. She leaves the table happy and totally conquered. 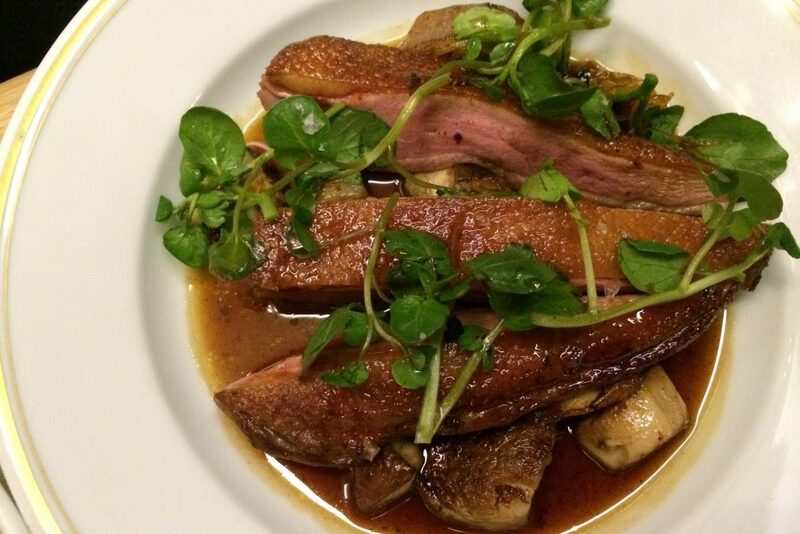 L’Express (2015) calls this a love letter to bistro cuisine. 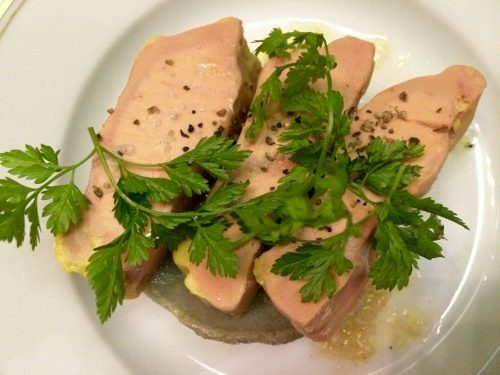 Le Figaro (2015) praises the creamy artichoke heart with foie gras and the pot-au-feu with a slice of crispy head with ravigote sauce – a “model recipe.” Like Caroline Mignot, they’re crazy for the crème caramel. 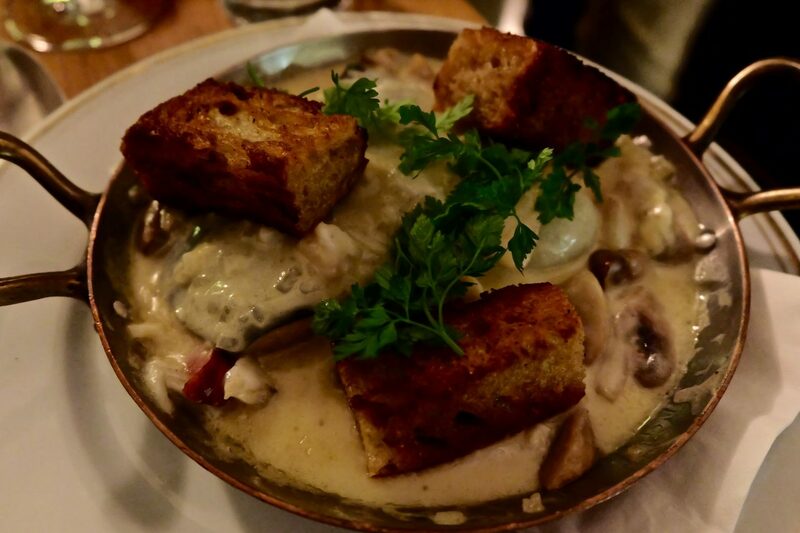 Le Fooding (2015) raves about the pot-au-feu served with a rosy quasi de veau, os à moelle, crispy tête with sauce ravigote, and a bouillon from another galaxy garnished by a giant cèpe mushroom, mint, and lemon zest.